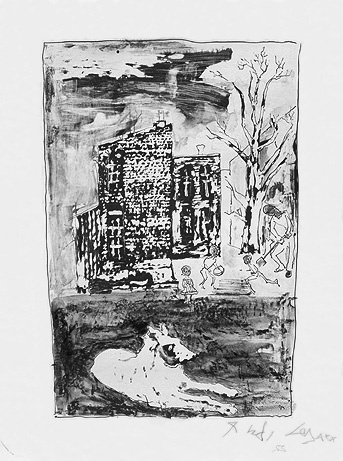 Untitled (Citiscape with Dog) - - 1953, Lithograph. Image size 10 1/8 x 14 3/4 inches (257 x 375 mm); sheet size 24 1/8 x 19 3/4 inches (613 x 502 mm). A fine impression, with full margins (4 1/4 to 5 15/16 inches), on cream wove paper, in excellent condition.